I have personally fluctuated between wearing an Apple Watch and a Fitbit Charge for the last 3 years, but the key drivers of my adoption stem primarily from aspirational personal goals of working out more and living a healthier life. Unfortunately, neither of these tools has made much of a difference in my own habits - but that is a story for a different day. I don’t know many people who swear by these devices, and I wanted to do some digging myself to better understand where they are making a difference. Punchline: I was disappointed with what I found. The “medical wearables” market, while smaller, is also growing rapidly - expected to reach revenue of $14.4B by 2022 (MarketsAndMarkets). This segment includes devices for measuring blood pressure, tracking glucose levels, monitoring falls, and many more use cases. Because they have been designed specifically for a particular medical purpose, these devices tend to have greater adoption (also driven by insurance coverage and integration with the clinical ecosystem). However, they also tend to be more uncomfortable for patients to wear and much more expensive than consumer wearables. 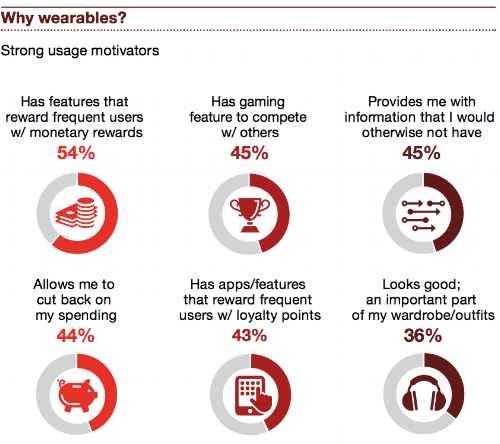 Currently 48% of individuals over 65 and 47% under 65 are interested in using wearables (17%, 20% adoption rate, respectively). Excitement continues to build among consumers motivated to improve or maintain their health status. However, despite the size of this market, we still see daily abandonment rates reaching upwards of 30% for specific devices. This trend is more indicative of a passing fad than a meaningful solution. Why? I cannot tell you how many times I have fluctuated between using and not using my wearable devices. For me, it comes down to lack of a clear use case for the data that it presents to me. I have a hard time knowing when I am meeting my goals or even trusting some of the proprietary metrics established by vendors. In general, consumers cite similar reasons for not continuing to utilize their devices: use case is unclear, easy to lose, unattractive / uncomfortable, short battery life, does not sync well with Smartphone, etc. Medical Wearables designed for specific clinical purposes (e.g., blood pressure, glucose measurement, etc.) are starting to become pervasive in helping to improve patient care. The best example of this is the Abbott Freestyle Libre which measures glucose through a patch the patient wears on his or her arm. To be clear, I believe that these devices have been a resounding success to date, and the focus of this section does not specifically include these types of devices. Instead, I believe there has been significant failure in the adoption of data captured from consumer devices in the clinical setting (when is the last time your doctor asked to see your Fitbit data?). The primary reason we typically hear is that physicians do not have time to scan through the vast amounts of raw data captured from consumer devices to glean clinically significant insights. The information is not integrated into the EHR in a way that makes it easily accessible in physician workflows. While this is absolutely a problem that needs to be addressed, I believe the problem itself is much deeper: the structure of current provider business models does not incentivize the use of this information. As I wrote about in a previous post (Addressing SDoH For a Better Tomorrow), patient quality of life is not primarily dictated by what happens inside the clinic. Instead, patient behaviors and circumstances outside the office tend to play a bigger role in the health challenges individuals face. You would think this would mean that data captured from consumer devices could play a major role in helping inform clinical interventions - but that is not the case. There is not a profitable ICD10 code associated with the review of wearable device data in the fee for service ecosystem. The biggest difference between consumer wearables and medical wearables is in their ability to provide information that is meaningful to practicing physicians. When consumer sensor technology becomes adequately precise in measurement (e.g., Apple EKG) and medical wearable devices are designed to meet the ergonomic needs of consumers, I believe we will see these two segments converge to meaningfully help patients. Until then, product market fit will be constrained to niche segments and wearables will remain nothing more than a tech-enabled fashion statement.